If you are visiting Cusco or Lake Titicaca, know about Acclimatizing before you land there..
Don't be confused, it may be a ingredient of cocaine, but still Cocoa leaves is perfectly legal to buy in Peru. But it is illegal in most of the neighboring countries, so don't carry the cocoa bag with you while leaving Peru and entering another country. I know you are interested to see Machu Picchu, not Aguas Calientes. Actually this is so small a city nobody knows much about it. I would not mind if you say, you have never heard this name - "Aguas Calientes". But believe me if you gather some information on this city before you leave for Machu Picchu, it would be very helpful for you. Guess why? Because you have to be in this city if you want to go Machu Picchu. All the train to Machu Picchu stops here. Then you need the bus ride to go to Machu Picchu. And if you want to stay one or more nights in Machu Picchu, may be this is the place where you would finally settle down. In Machu Picchu there is only one hotel (more than $ 600.00 a night). Also other than that same expensive hotel (Machu Picchu Sanctuary Lodge) there is no place to eat in Machu Picchu. So for dinner and lunch you have to come back in Aguas Calientes. The town is small, but may become very expensive if you have no idea where to eat or where to sleep. It is really a weird town, many funny things you will find here. Should I mention some? Suppose you are thinking of early wake up. But in the morning you don't need a wake up call, why....? The morning train left Aguas at 5.30 am. When it moves, it is like passing through your room. And vibration? That is something you may not ever forget. Believe me you do not need a wake up call. Eat something in the restaurant at train platform. You will find trains are passing within two meter from your table. Some time they place the table at rail track, and shift the table away, when train comes. Funny, right? I told you, it is a weird town. As I said this is a very small town, actually there is only one road. At the center of this town you will see Statue of Pachacutec. This is the main part of the town. This place is called Main Square. You may like to roam around this place, especially at night. There is an old big church here. I think in every Peruvian town there is a big church. Two markets they have in Aguas Calientes. The bigger one is on the road to Machu Picchu. The other one is by the side of train station. You may like the train side market more. This market is interesting, colorful too. Once you reach the station, you have to walk along this market. Guess why? When you would try to get out of the platform you may not find any exit. Actually, the exit is at the end of this market. So they make you move along this market. But to tell you frankly, there is not much thing to buy. This town may be small, but you will find lot of restaurants here. They sell pizza and alpaca. One thing seemed to me surprising. What it is? In this town I saw more pizza shop than anywhere else. I think they have more Pizza shop than they have in Italy. If you go to the top of the hill, you may get cheap food there (almost half price!, but at same quality). When you go to restaurant to eat, ask for touristico. It is a 3 course meal. Not expensive, three to four US dollar. I already write a whole page on hotels of this town. They have all ranges of hotels here. You can get hotels at US $15/20 a night. Some hotels like Hostal Presidente, Rupa Wasi, Eco Lodge or Hostal Machu Picchu are very popular. These hotels are cheap. If you want to stay in a high quality hotel you may choose Inkaterra Machu Picchu Hotel also known as Machu Picchu Pueblo Hotel. Rooms starts here from 350.00 $ a night. 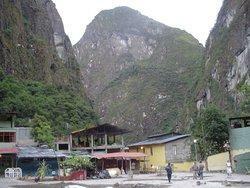 Check my page on Hotels at Aguas Calientes. Also I would like you to know that there are some very cheap places in this town. You may like Hotel John, which may cost you only 3/4 US dollar a night. You may have heard lot of things about the	hot springs of Aguas Calientes. Like "Aguas Calientes" means Hot Spring, but I did not like those springs here, they smelled .... not good. They didn't look good either (It is cheap though..). But I know lot of people eventually try to take a taste of it. So I think I should write here how to reach there ( the city is so small, you don't need any direction though, ha ha ha ). If you start moving towards east from the town, (only one way to go to east) I think it is less than a kilometer before you reach the hot springs. At that place underground hot sulfur springs bubble up from the rocky ground. They have built pools, where you can take bath. Temperature of water is between 38ºc and 46ºc. You will find changing rooms and bathrooms there. And if you need to eat something, there is also a small snack bar for you.